On Volume Two of Arhoolie's Sacred Steel series, Chuck Campbell and his 12-string MSA take the spotlight. Chuck's playing is a mix of bluesy electronic leads and full chord rhythms. His creative use of E-Bow and "wah" effects gives his guitar an expressive voice as he trades lines with singer Katie Jackson. Brothers Phil and Carl Campbell (not pictured) provide the strong, rockin' rhythm section for this CD. Youngest brother Darick takes the lead on his 8 string Fender for several tracks, and closes the album with Chuck in a soulful steel duet. This CD defines the meaning of "a joyful noise" to my way of thinking. 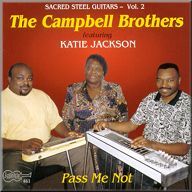 Produced by the Campbell Brothers themselves, it captures their music as they play it live on tour at concerts, and in church. The album also includes vocal, sermons and testimony by a variety of folks for a total uplifting experience! "Can You Feel It? " Here's music to get you on your feet, clapping and shouting. 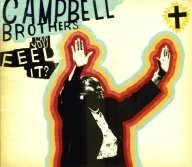 Produced by John Medeski in 2005, this is the Campbell Brothers' first release on the Ropeadope label. They've added a bass player (Malcolm Kirby) and Medeski sat in on organ for a few of the tracks. 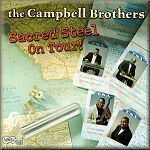 I'm a huge fan of Sacred Steel music, and nobody does it better than the Campbells, in my opinion. This CD is their most professional to date. It captures the grooves of their live shows, but with the high production values of Medeski's studio chops.